Alfred Kahn is a legendary figure in certain circles, largely because he is credited with deregulating the airline industry and thus making air travel affordable, though stressful, for millions of people. An economist by training and a former chair of New York’s utility commission, Kahn was cast in his most famous role by President Carter, who made him the head of the now-defunct Civil Aeronautics Board (CAB) in 1977. That’s roughly the way I think of the transmission towers that Eversource wants to build along 132 of the 192 miles of its proposed Northern Pass transmission project. I am not as indifferent to their physical appearance as the late Alfred Kahn was to airplanes. But as the official representative of the interests of residential utility customers, I am laser-focused on the financial implications of the project. From that standpoint, the towers are basically just marginal costs with wires. The key questions are: Will New Hampshire customers pay for Northern Pass? Will they receive any financial benefits from it? The answer to the latter question changed a bit recently, thanks to a settlement agreement we and the staff of the Public Utilities Commission were recently able to negotiate with Northern Pass. Fifteen million bucks, parceled out over the 40-year useful life of the project, is not exactly a Megabucks ratepayer jackpot. But if the project is ever built, and this particular money stream is turned on, we will use it to subsidize non-transmission alternatives — specific experiments with things like microgrids, batteries, small-scale renewable generation and demand reduction that will avoid the need to build more transmission lines. The logic behind the $15 million fund is pretty interesting. Traditionally, transmission projects in New Hampshire get their routes via eminent domain. The utility decides where it wants the line to go, gets regulatory approval, and is then able to seize the land upon paying the constitutionally required just compensation. But the Legislature has specifically withheld eminent domain authority from Northern Pass. Northern Pass thus confronted the daunting and expensive task of persuading landowners to agree to hosting a new transmission line. And who better to persuade Eversource New Hampshire, a sister company that happens to own an existing transmission corridor that slices north-to-south through the Granite State? 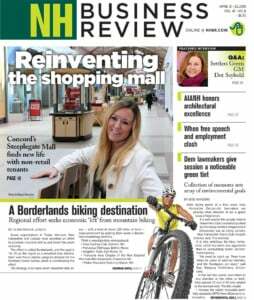 So, Northern Pass and Eversource signed a lease and, voila! Fully 100 miles of the 192-mile route of Northern Pass were locked up. But here’s the thing. Eversource, and before that Public Service of NH, has for years been recovering the cost of owning the transmission corridor through transmission rates paid by customers. So ratepayers are entitled to the benefits of PSNH leasing space in its transmission corridor to a merchant transmission project like Northern Pass — a project whose purpose is to benefit Hydro-Quebec in its effort to sell energy in southern New England. Eversource’s appraiser said the lease is worth just under $800,000 a year. Our director of finance, admittedly not an appraiser by training, looked into similar leases in other states and concluded the right number is really $4.1 million. To our astonishment, the appraiser hired by the PUC concluded that Northern Pass had agreed to pay too much for the lease. His annual figure was a paltry $120,000. It turns out the PUC managed to hire the one appraiser who has built a niche for himself by going around the country arguing that transmission corridors are drastically over-valued. Go figure. This looked like a pretty grim bit of administrative litigation from a ratepayer perspective until we focused on the fact that Eversource’s transmission facilities are paid for through regional transmission rates – i.e., rates paid by all New England customers. New Hampshire uses less than 10 percent of New England’s electricity, so New Hampshire’s share of the lease payments would likewise be less than 10 percent. If our director of finance is right and the lease is really worth $4.1 million a year, the share for New Hampshire customers is $410,000. Multiply that by 40 years and you get $16.4 million. We got most of that via our settlement, thanks to the $15 million fund plus lease payments that will fall halfway between the results adopted by the two rival appraisers. But it is a victory nonetheless, as we will argue when the lease comes before the PUC for a hearing on Nov. 28. At that hearing, we won’t be arguing that Northern Pass should be built. That’s for the Site Evaluation Committee to decide, and we don’t pretend that this small ratepayer victory tips the scale when considering all of the aesthetic, economic and physical impacts the SEC must evaluate. Still, I like to think that Alfred Kahn, whose 100th birthday was a few weeks ago, would approve of our deal. D. Maurice Kreis heads New Hampshire’s Office of Consumer Advocate.